Just ahead on the highway, there’s an exit ramp no one’s ever noticed before. At the edge of the woods, a trail you can only see if you know just where to look. Hidden in your own basement, a door you’ve walked past a thousand times without noticing. Congratulations. You’ve found the Back Roads. Good luck finding your way back home. Penny Lazarus has spent her entire life wishing she could escape from the real world. Through it all, she had exactly one friend – her sister, Dana – and now Dana’s dead, drowned in the distant Pacific under mysterious circumstances. But she left something behind, meant only for her sister’s eyes: a surreal teen-road-trip screenplay, BACK ROADS TO VEGAS. Penny sets out into the wilds of West Virginia to make her sister’s movie…and winds up taking an unplanned detour, straight off I-64 and into a madcap alternate America. Here, in the hidden country known as the Back Roads, every individual’s deepest desire emerges as a powerful supernatural ability. In Penny’s case, that means she’s a Veil, capable of turning herself invisible, intangible, ghost-like. Stranger yet, this is a place Dana somehow knew about. That bizarro screenplay? A veiled code, Penny soon realizes, embedded with clues leading deeper into the unknown. The only problem is that nearly everything in the Back Country is trying to kill her and/or drag her soul away to netherworldly depths. Like the man-eating mosquitoes. And the gangs of slave-trading cyborg bikers, and the soul-devouring tree haunted by its long-dead victims, and the snake-handling zealot who’s mesmerized his flock into following him to the depths of Hell. Also, Death himself, who turns out to be kind of a jerk in real life. She’s got help, too, for whatever it’s worth: a fierce mountain-woman werewolf and a guitar-slinging thief who slowly but surely ensnares Penny’s heart, entirely against her better instincts. What she hoped to find was the truth behind her sister’s fate. But what awaits her at the end of the road is something even bigger – the dark secret of her own world-shattering destiny. 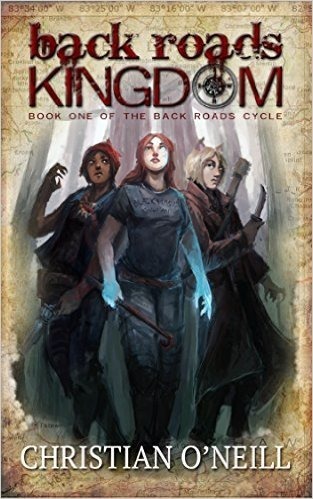 I was wary going in to Back Roads Kingdom by Christian O’Neill. To be honest, the cover threw me off. It looked vaguely anime and featured fox-eared and magic wielding people, and I was more than a little afraid that I was going to open the cover and find out some anime fan boy had scribbled out a melodramatic fantasy tale with goofy dialogue and ridiculous villains. If you too looked at the cover of this book and thought “eh… maybe I’ll pass this one by” STOP. Pick up this book. It isn’t what you think. I’ll admit, diving in to the narrative, I was a little put off. The beginning of the story wasn’t the easiest to follow. Littered with flashbacks, absent twins, and mentions of bouts in a mental institution, I had a hard time sinking into the story. It took me awhile to grasp what was going on—but once I did? You couldn’t pry the book out of my hands with a crowbar—even with one that may or may not turn into a magical flaming sword. The characters were brilliantly complex, each with their own motivations and personalities. The world building was familiar but also lavishly unnatural, and despite the back and forth switching between memories, the present, different dimensions, and different view points, the text was easy to read….if a little hard to follow at first. Confused? Yah, me too. The story reminded me of following Alice (or Penny in this case) down the rabbit hole, and instead of ending up in Wonderland, I ended up in the Appalachian Mountains—complete with hillbilly witch doctors that swig hexed moonshine, and snake-handling preachers with the ability to mesmerize any poor fool to cross their path—and that barely scratches the surface of what Penny encounters in the Back Roads. I don’t want to spoil this story for you, but I can say this: It wasn’t what I expected. It was complex, filled with adventure, good natured hijinks, and some ill-natured trickery. If you’re looking for a fresh idea on a modern fantasy, I highly recommend you check this out. I cannot wait for the second book in the series! Help to keep reviews on Amazon honest. If you run across a review on Amazon like mine, that are honest and well written, please take the time to support a reviewer and vote it up. Let's make sure honest reviewers are rewarded for their time and effort... not those who troll authors with personal attacks, or write dishonest reviews in exchange for profit. Thanks!